The HS-2D imager is a value level portable solution for decoding both linear barcodes and 2D symbols in common applications such as high contrast black and white labels. It reads symbols in any orientation, includes a built-in dual LED targeting system for quick and easy data capture, and is designed to withstand rugged industrial environments. The HS-2D imager is ideal for any high contrast automated data application from clean rooms to industrial environments. 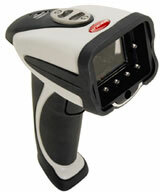 The Microscan 98-000107-01 is also known as Microscan Systems	98-000107-01	or 9800010701	.